Scandyna is bolstering its curvy pod loudspeaker range with a new model dubbed The Drop. 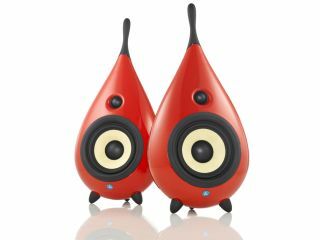 The compact, teardrop-shaped speaker has been designed to deliver great sound whatever the source - your laptop, Apple iPod, hi-fi or home cinema system, for example. The Drop is a two-way closed box comprising a 125mm Kevlar mid/bass driver and a 25mm high-frequency tweeter wrapped in a molded ABS (Acrylonitrile Butadiene Styrene) cabinet. This is the same stuff used in some musical instruments and Lego bricks. Scandyna says The Drop will work with any amp with a power output of between 10W and 100W. It offers 89dB sensitivity into 4 ohms and has a frequency response of -6dB at 50Hz and 22kHz. Available in six different colours (black, white, red, yellow, green, blue) The Drop stands just 437mm tall, 215mm wide and 170mm deep without spikes. Scandyna's The Drop is available now for £549 per pair.